Today, the 1st day of the 12th month, is celebrated as buelwa phuewi nyim – the traditional day of offering. The tradition of people making offerings to the Dratshang on this day seems to have been popularized as an expression of love, devotion and loyalty to Zhabdrung Ngawang Namgyal. Today is also celebrated as chunipai losar – a new year. 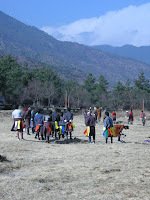 Families and entire communities, especially in Eastern Bhutan, feast and enjoy traditional sports together for several days to welcome the new agricultural season. At the end of these non-stop festivities farmers begin the hard work of preparing their fields for the new farming cycle. So let’s celebrate. Then get down to hard work. And there’s plenty of that in the new democratic Bhutan where offerings – of services and fulfilled promises – must be made to the people, not by them. Our King and our Constitution demand nothing less.